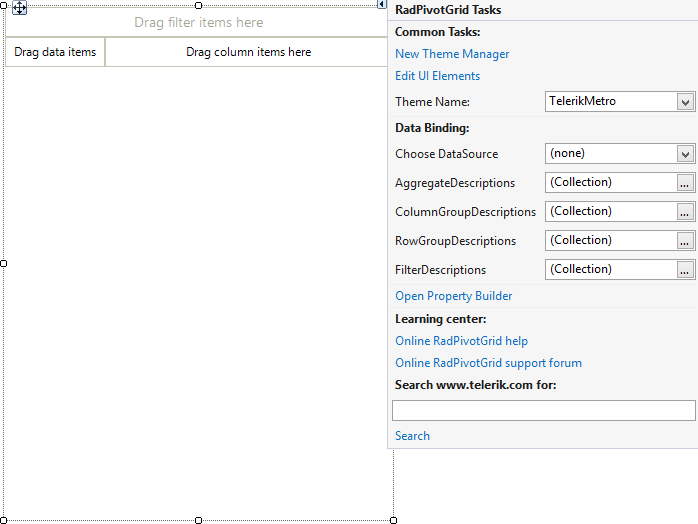 To start using RadPivotGrid just drag it from the toolbox and drop it at the form. Select RadPivotGrid and click the small arrow on the top right position in order to open the Smart Tag. Choose DataSource: Populates the pivot with the specified data source object. ColumnGroupDescriptions: Specifies the column groups. RowGroupDescriptions: Specifies the row groups. FilterDescriptions: Allows you to specify the rules for filtering. Learning Center: Navigates to the Telerik help, code library projects or support forum. Search: Searches the Telerik website for a given query.